Timothy Quigley deftly interweaves Celtic mythology, Christian dogma, street smarts, New Age drunk talk and mad men’s ravings, to create a deeply compassionate portrait of a jaded, disillusioned man’s struggle to get his life back on track. Pixel Hall Press is a relatively new, old-fashioned small publishing house whose focus is on discovering literary gems and great stories by gifted writers that might have otherwise been overlooked. This includes not only full length novels, but finely crafted short story eBook singles, print short story anthologies and collections, and even novellas, in both print and eBook formats. 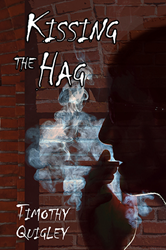 Pixel Hall Press's most recent acquisition -- "Kissing the Hag" a new novella by Timothy Quigley -- will be published in late 2014, as a trade paperback and an eBook in all formats. Book reviewers should contact Cynthia Dadson (Cynthia [at] PixelHallPress [dot] com) to be put on the list to receive a prepublication review copy in autumn, 2014. Since the suicide of his younger brother, Julien has burrowed away from life, turning his back on family and friends. His only human contacts are the denizens of a downtown Boston homeless shelter where he works the graveyard shift. Through the course of one night at the shelter, Julien traverses the dim caverns and blind curves of the human spirit via flashbacks and interactions with shelter transients, seeking some kind of resolution and purpose. Timothy Quigley’s award-winning stories have appeared in "Line Zero Journal of Art and Literature," "La Ostra Magazine," "Writer’s World," as well as various online publications. He is also the screenwriter of two short films; one animated, currently in preproduction, and the other a live action adapted from one of his short stories, slated to begin production in October 2014. He is currently working on a feature-length film adaptation of his novella "Kissing the Hag," as well as a collection of short stories. Quigley received his MFA in Writing from Vermont College of Norwich University, and currently teaches writing at Salem State University and Wheelock College in Boston. Pixel Hall Press is a small boutique publisher that releases only a few books and short stories a year, focusing on quality rather than quantity. Their mission is to publish books that energize the imagination and intrigue the mind, and to be a conduit between readers and provocative, stimulating, talented authors. In this era of digital technology, Wall Street involvement and merger mania, mainstream publishers seem to have lost sight of the core principles and purpose of publishing. At the other end of the spectrum is an avalanche of self-published books that are notoriously uneven in quality. Small boutique imprints, such as Pixel Hall Press, are reclaiming the heart and soul of publishing by reviving the idea that a publisher's raison d'être is to find and nurture great writers, and to provide readers with beautiful, meaningful, truly enjoyable books.